Valentines is coming up again, and like last year I want to get my creative on and bake some lovingly scrumptious valentines treats. Last year I made chocolate chip and vanilla heart shaped cupcakes with pink vanilla frosting. I based the recipe from one from the Hummingbird Bakery cookbook, which was my first and the one I will always refer to compare to other recipes. 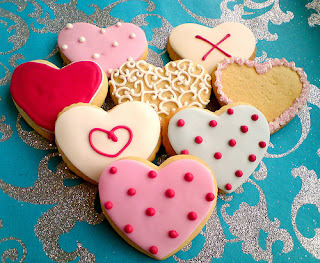 Anyway... the way I made them heart shaped is by using heart shaped silicone cases, and although they looked pretty it was such a mess and such a hassle to eat them. Because they are made of rubber, you have to sort of pop the whole cupcake out, which, if you're as clumsy as me means a lot of icing everywhere. I'm a sucker for traditional paper cases, so I can just rip into it and get my munch on. So this year, as much as I lke to make cupcakes, I want to experiment... (let's just hope my boyfriend doesn't read this post or else he'll be ruining the possible surprise). I first saw these amazing peppermint button shaped treats in my friends Australian magazine Frankie and I was inspired immediately! This would be so much hard work, and there is no way mine would look anything like these as these were probably made with molds. 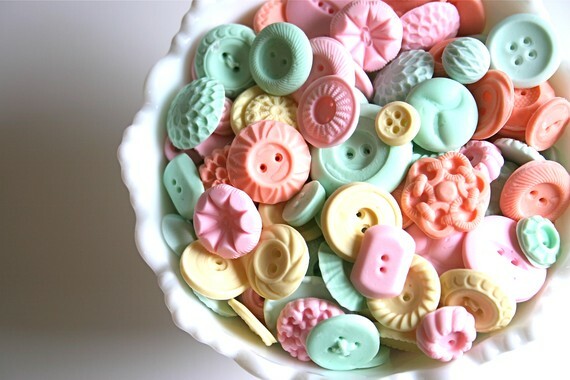 But what I love about these are the different colours and shapes, and I could definitely incorporate some heart shaped ones in there. Plus I've already made peppermint creams in the past, they are so simple to make and just enough of a sugary treat, when handed round a group of work colleagues!